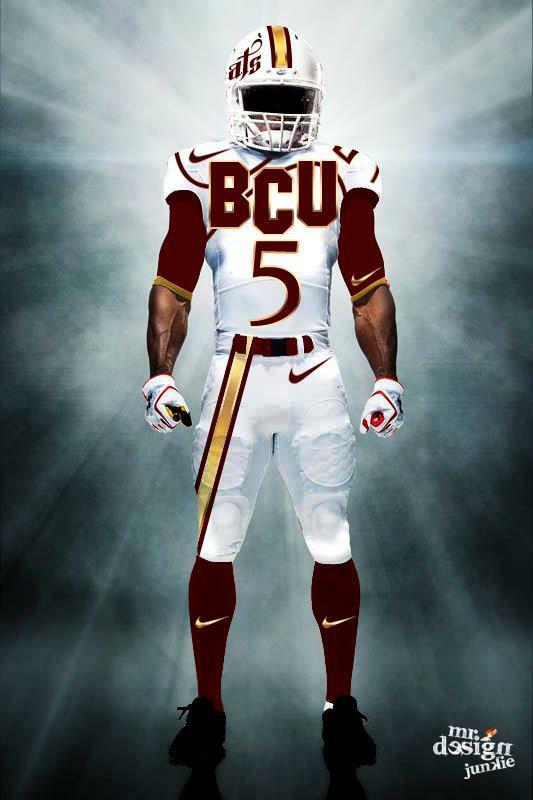 Football – Mobile – B-CUAthletics.com – The Official Web Site of Bethune-Cookman Athletics. You can use two words to sum up Bethune-Cookman’s 24-14 first round playoff defeat to Coastal Carolina: MISSED OPPORTUNITIES. On BCU’s first two (2) possessions of Saturday’s matchup against the Chanticleers, quarterback Quentin Williams overshot passes to Jhomo Gordon, KJ Stroud, and Eddie Poole that would have been surefire touchdowns. Daytona Beach native DJ Howard had an opportunity to return a pick six from inside the CCU 15 yard line on the Chants opening offensive possession, however, the Spruce Creek product was unable to hold on to the interception. So instead of the Wildcats leading by 2 or 3 scores early in the contest, they found themselves trailing 17-0 heading into halftime. “In the playoffs you’ve got to seize opportunities. If you don’t, the opportunity will go right pass you” quarterback Quentin Williams stated. He went on to state “in the playoffs it’s not about who’s better or who’s worse, it is about who takes advantage of the opportunities”. While BCU missed on its chances, CCU took full advantage of the Wildcats’ miscues and scored 10 points off of 2 BCU turnovers in the second quarter. Coastal Carolina opened the game’s scoring on a 6 play 75 yard drive with 13:50 seconds remaining in the 2nd quarter. The drive was capped by a 14 yard option run by Marcus Whitener. The Wildcats initially defended the play well but senior quarterback Aramis Hillary pitched the ball late allowing Whitener to run untouched for the opening score. The Chants doubled their lead when All Big South 1st team receiver Matt Hazel outleaped Tim Burke in the left corner of the endzone to cap a 9 play 58 yard drive with 7:23 left in the 2nd quarter. “I told coach to call that play” Hazel stated. (They were) “in man coverage across the board. Aramis threw a great ball and I saw it at the last minute and just went and got it”. Controversy struck on BCU’s next possession. Trailing 14-0 midway through the second quarter, Williams hit tight end Jordan Murphy for a short gain. Murphy was originally ruled down on the play but a booth review overturned the call. Coach Brian Jenkins went ballistic when the game’s head official announced the decision to overturn the call. “(Jordan) did fumble. We had a couple of players in the area but (when the official blew the play dead) they stopped. Their player recovered the ball but if you blow the play dead, I don’t understand how you go back and review it. My argument was you blew the play dead so it negates anything else” Jenkins stated. Coastal took over possession at the BCU 43 yard line as a result of the play. 5 plays later, Apopka High School product, Alex Catron, pushed CCU’s lead to 17-0 on a 35 yard FG conversion. The score remained unchanged heading into intermission. Early in the 3rd quarter, redshirt freshmen Nick Addison picked off an Aramis Hillary pass in the endzone to help breathe life into the Wildcats. But the Chanticleer defense kept BCU off the scoreboard on the ensuing possession. Brodrick Waters entered the contest for an ineffective Quentin Williams on the Wildcats second possession in the 3rd quarter. Waters broke on a 57 yard run on his first drive under center. BCU got the ball as deep as the CCU 4 yard line on the drive but a false start penalty pushed the ball back to the CCU 11 yard line. Coach Jenkins suffered his second visible meltdown of the game and had to be physically restrained by BCU administrators and coaches after the false start penalty was called against his squad. “We had our guys go from a 2 point stand to a 3 point stand and they called us for a false start. None of our guys jumped. Two officials called offsides and one called illegal shift. When I asked for an explanation I got three different answers”. Jenkins’ was given an unsportsmanlike conduct penalty for his reaction to the call and cost his team an opportunity for a chip shot field goal. The result of the play put the ball on the 26 yard line but instead of attempting a 43 yard FG, Jenkins decided to go for it on 4th and 26. Waters found KJ Stroud in the back of the endzone on the 4th and 26 play and BCU seemed to be back in business. But it wasn’t meant to be. The television replay showed Stroud’s hand landed out of bounds before his foot landed in the endzone. The overturned touchdown call embodied BCU’s afternoon of missed opportunities. Coastal Carolina safety, Johnnie Houston put the game out of reach when he returned a Brodrick Waters’ interception 68 yards to put Coastal ahead 24-0. Houston’s return was the 2nd longest interception return in school history. A 74 yard touchdown pass from Quentin Williams to David Blackwell with 6:44 left in the game gave Bethune its first points of the afternoon. Williams connected with KJ Stroud in the back of the endzone on the 2 point conversion attempt to cut the lead into a two possession contest (24-8). Isidore Jackson’s 10 yard touchdown run capped off the game’s scoring. Jackson, who needed just 8 yards rushing to reach 1,000 on the season, finished the contest with 77 yards on the ground and 1,069 on the year. Jackson’s 1,069 yards represents the 3rd best rushing season in BCU history. Quentin Williams threw for 215 yards and 1 touchdown. It was the first time he surpassed the 200 yard passing mark in his career. Jarkevis Fields led the Wildcats defense with 15 tackles. Nick Addison pitched in with 10 tackles, 1 fumble recovery and an interception. The MEAC is now 0 for its last 17 as a conference in the FCS playoffs. Redshirt freshmen, Nick Addison and Quentin Williams, vowed to take this bad feeling and get better in the offseason. Both players stated that Bethune-Cookman will win a playoff game before their eligibility expires in three years. The Wildcats are now 0-4 in the FCS playoffs. The win secured Coastal Carolina’s first ever playoff victory. The Chanticleers will travel to Norfolk, Virgina next week to take on #4 ranked Old Dominion. The Live Chat will provide posters with a highly interactive platform in which they can discuss and follow the game as it is happening live. The Live Chat interfaces with Twitter, Facebook, and Youtube. @BCUAthletics, @BCUExaminer, and @HailWildcats Twitter feeds will interface with the Live Chat. This will allow the posters to interact with the men and women who are dedicated to bringing you the most in-depth coverage of Bethune-Cookman football. The Chat will also allow users to access the most up to date gameday information from one centralized location. You can participate in the Live Chat by posting your opinions/feedback/questions or by simply following along. All are encouraged to participate. The Live Chat Link will become active at approximately 1:45 p.m. on gameday. If Bethune-Cookman head coach Brian Jenkins and Coastal Carolina head coach Joe Moglia ever decided to talk football over a cup of coffee (or quality adult beverage), the two men are likely to share very similar coaching stories. Moglia, who is in his first season at CCU, guided the Chanticleers to a three-way share of the Big South conference title and earned the league’s FCS playoff automatic qualifier bid. Jenkins led his Fighting Wildcats to a three-way share of the MEAC crown and the conference’s AQ in his first season at Bethune in 2010. Jenkins and Moglia have both been named as 2012 Eddie Robinson Coach of the Year Award finalist; both coaches are disciples of the spread offense; and they both preach the gospel of ‘developing young men’. Hillary’s favorite target this season has been fellow Big South 1st team selectee Matt Hazel. The 6-3, 190 pound junior receiver has caught 49 passes for 615 yards and 5 touchdowns. Hazel was described by his coach as a precise route runner who understands coverages and has great hands. Offensive Center Pat Williams and slot receiver/punt returner Niccolo Mastromatteo are also Big South first team performers. It was Williams and Mastromatteo that jumped off the film for coach Brian Jenkins. “#20 (Mastromatteo) is very exciting. I really like watching him on film. I have this thing for little guys and I don’t know why”. Coach Jenkins went on to state: “the Center (Williams) is a very physical, nasty player, and I mean nasty in a good way, not in a cheap shot way. He plays the game like an old-school football player and I love that”. The Chanticleers boost an explosive offense whose greatest strength lie in its balance. On the season, CCU has rushed for 2200 yards while gaining 2569 through the air. Quarterback Aramis Hillary has the ability to break contain and extend plays with his feet. Wide out Matt Hazel was one of the Big South’s best possession receivers this season while fellow wide-out Niccolo Mastromatteo proved to be one of the most explosive players in the conference. The Wildcat defense has been good all year applying pressure on opposing quarterbacks and will need to do so on Saturday to help slow down the Coastal offensive attack. The defensive front and particularly the defensive ends will need to remain discipline in their pass rush responsibilities and keep their containment assignments. On the back end, BCU’s secondary has been outstanding this year at limiting big plays through the air and taking the ball away. They will need to turn in another top flight effort on Saturday in hopes of keeping the CCU offense contained. Notable: WR/PR Niccolo Mastromatteo is responsible for the 2nd and 3rd longest scoring plays in CCU football history (a 91 yard punt return against Charleston Southern in 2010 and an 81 yard punt return against Presbyterian earlier this season). From a statistical standpoint, the Chanticleers defense has been less than stellar throughout the course of the season. CCU ranks in the bottom third in most of the important national defensive statistical categories. The Chants give up an average of 26.55 points per game, 181 yards rushing per contest, and over 400 yards of total offense. Playoff bound opponent Appalachian State racked up 684 yards of offense on CCU while 3-8 Gardner-Webb piled up 547 yards of offense on the Chants. Despite the statistics, coach Jenkins sees a defense on film who is “a well-coached football team. The defensive front is very aggressive, their linebackers run to the ball well, and the defensive secondary don’t get beat deep much”. Sophomore linebacker Quinn Backus is an All-American candidate and was named the Big South Defensive Player of the year this season. Backus set the CCU single-season mark with 123 tackles and ranks 10th nationally averaging 11.2 tackles per contest. He was also responsible for forcing 3 fumbles and picking off 2 passes this season. Coach Moglia stated in his weekly teleconference that the Wildcats will move the ball on his squad but his team must limit the big plays. With that in mind, BCU’s offense must take advantage of a CCU defensive unit that has been poorest at spots throughout the season. The Wildcat offense can ill-afford to help the CCU defense by putting themselves in adverse situations and piling up reckless penalties. CCU’s base defense is a 4-2-5. BCU must use their size advantage up front to establish the running game. You would also like to see the Wildcats not struggle to the slow start that has plagued them at times this season. If the Wildcats protect the ball and execute to their normal standard, they should find great success against the Chanticleer defense. Chanticleer (SHON-ti-cleer) comes from Chaucer’s Canterbury Tales. A Chanticleer is a rooster who rules the barnyard with cunning and wit. His competitiveness never wanes as he battles to the end, using his brains to come out on top. ~ Junior running back, Isidore Jackson, needs just 8 more yards to reach 1,000 yards on the season. Jackson would be just the 6th BCU player in the modern era to reach the 1,000 yard milestone and the first to do so since quarterback Allen Suber ran for 1,035 in 2002. ~ Assuming Quentin Williams doesn’t turn an ankle in practice, this will be the first time BCU has entered a playoff contest with a healthy signal-caller. In BCU’s last playoff appearance (2010), MEAC Offensive Player of the Year, Matt Johnson, was unable to participate due to a shoulder injury. Coach Jenkins stated earlier this week that 11 starters on offense and defense were missing in that game. ~ A win on Saturday would give BCU its fourth 10-win season in history and the 2nd in the Brian Jenkins era. Kickoff is scheduled for 2:00 p.m. The game will be streamed live on WatchESPN.com. HailWildcats.com will host a Live Chat during the game. The Live Chat will provide posters with a highly interactive platform in which they can discuss and follow the game as it is happening live. The Live Chat interfaces with Twitter, Facebook, and Youtube. The Live Chat Link will become active at approximately 1:45 p.m. on gameday and will be available on the HailWildcats.com front page. Bradford Gillens – Coastal Carolina head coach Joe Moglia has somewhat of an idea of the competitiveness in the Mid-Eastern Athletic Conference, having played conference member North Carolina A&T in his first game as head coach of the Chants. CCU won the game 29-13, but the former TD Amertrade CEO knows there is a big difference between the Aggies team he faced in September and the Bethune-Cookman team he will face Saturday in Daytona Beach in the opening round of the Football Championship Subdivision playoffs. While Moglia was quick to offer praise of the Wildcats, his Chanticleers enter the game riding a five game winning streak where they’ve averaged 46.2 points per game in those contests. Leading the offensive explosion has been senior dual threat quarterback Aramis Hillary. The All Big South first teamer leads the conference in total yards this season with 2,617 (2,133 passing, 484 rushing) and 20 total touchdowns and is the catalyst for the Coastal Carolina offense. Hailwildcats.com will host a Live Chat during this Saturday’s 1st round FCS Playoff game between Bethune-Cookman and Coastal Carolina.The Live Chat will provide posters with a highly interactive platform in which they can discuss and follow the game as it is happening live. The Live Chat interfaces with Twitter, Facebook, and Youtube. The Live Chat Link will become active at approximately 1:30 p.m. on gameday and will be available on the HailWildcats.com front page. Thanks for your support and Hail Wildcats! Bradford Gillens – The last time Bethune-Cookman hosted a playoff game in the friendly confines of Municipal Stadium in Daytona Beach, they were outscored 31-6 in the second half after a 14-14 tie, falling to the University of New Hampshire, 45-20. It was a particularly disappointing day for head coach Brian Jenkins and the Wildcats, as they dropped their second consecutive game after starting the season 10-0. Anyone who knows Jenkins knows he’s extremely competitive and has never been secretive about his extreme disdain of losing. In fact, he indicated there are games from high school where he came out on the losing end that he still remembers to this day and it still bothers him, so one would have to think that he hasn’t gotten over the poor performance of his team in his playoff debut two years ago. To say that he’s excited about the opportunity of getting another chance to capture the school’s first playoff victory in history this week against Coastal Carolina would be putting it mildly at best. At the conclusion of this past Saturday’s Florida Classic, coach Brian Jenkins was seen hugging players, celebrating with the Marching Wildcats, and wearing a 2012 MEAC Champions Belt around his waist. Yeah you heard me, coach Jenkins was rocking a Championship belt around his waist that Dusty Rhodes would have been proud to don. “I have been telling (our football team) about the belt. You want to be the one to put on the belt in the end. Right now this phase of our season is done. We have won this belt and hopefully we can put things together and be able to put on another (belt)” coach Jenkins stated. The Bethune-Cookman football team wore all white uniforms (helmets included) for the first time in school history on Saturday. The new white headgear is the fourth helmet the Wildcats have competed in during the Brian Jenkins era. When asked about the abundance of helmets and uniform combinations, coach Jenkins stated: “the young men deserve it. We are so hard on our young men throughout the year about doing things right. I believe in rewarding them for the effort that they put in for this university. So it’s things like that I do to show them appreciation for their effort, dedication, commitment and passion to each other, for each other, and also for this university”. He went on to state: “the guys did not know when the white helmets were coming. When they came into the locker room before the game, they saw the maroon helmets. They put them on (and went out for pregame). When they came back in (the locker room) they saw the white helmets. The helmets gave our guys a charge and some excitement to our fans”. “I don’t know you might see a different helmet next week” (in the playoff matchup). BCU is 4-0 in helmet reveal games during the Brian Jenkins era. Coach Brian Jenkins, who has led his Bethune-Cookman Wildcats to their second FCS playoff appearance in three years, has been named a 2012 Eddie Robinson Award Finalist. The award is presented annually to the national coach of the year in the Football Championship Subdivision (FCS) by The Sports Network. Coach Jenkins led BCU to their first ever 10-0 start when he arrived on campus in 2010. Saturday’s win earned the Wildcats their first ever 8-0 season in league play. The Wildcats, who earned the league’s automatic bid to the FCS playoffs, will host Big South champion Coastal Carolina on Saturday, Nov. 24 at 2 p.m. Tickets can be purchsed from the Bethune-Cookman Box Office or from Ticketmaster.com. Bethune-Cookman to Host Coastal Carolina in FCS Playoffs – B-CUAthletics.com – The Official Web Site of Bethune-Cookman Athletics. DAYTONA BEACH, Fla. – It was announced Sunday that Bethune-Cookman will host Coastal Carolina in a first round matchup of the Football Championship Subdivision (FCS) Playoffs next weekend at Municipal Stadium in Daytona Beach. Kickoff is set for Saturday, Nov. 24 at 2 p.m.
Tickets for the game will go on sale Monday at 10 a.m. Prices are $10 for students and $25 for reserved seats. To order, call the B-CU Ticket Office at (386) 481-2465, or log on to TicketMaster.com. ORLAND, Fla. – Bethune-Cookman held off a late charge from Florida A&M to secure its second straight victory in the Florida Blue Florida Classic. The Wildcats, who are headed to the FCS playoffs, have now won 7 consecutive games and 13 straight in MEAC play. Quentin Williams threw for 120 yards and one touchdown on 12-18 passing. Williams also rushed for 86 yards including a 51 yard scamper in the first quarter which helped setup Bethune’s first score of the afternoon. After trailing 10-7 at halftime, BCU scored on a 34-yard Isidore Jackson touchdown run with 3:13 remaining in the third quarter. Jackson ended the afternoon with 77 yards rushing leaving him just 8 yards shy of reaching 1,000 on the season. Andronicus Lovette added a 1-yard rushing score with 11:30 left to push BCU’s lead to 21-10. Florida A&M made a contest of it after Damien Fleming eluded a certain sack and connected with Dewayne Harvey for a 37-yard score to cut the lead to 5 (21-16) with 8:04 remaining. Fleming had a final opportunity to work his magic when the Rattlers took over possession on their own 47 with 3:49 left in the contest. However, it was the BCU defense that made the game defining play. On 2nd down and 17, Harold Love III chased down Fleming forcing a fumble with 1:17 seconds left in game. Tevin Toney recovered the fumble and raced 47 yards for an apparent BCU touchdown but the officials (who did not have a particularly great day at the office) initially ruled that the runner was down on the play but reversed the call after a booth review. The touchdown did not stand, but BCU was able to take over possession and run out the clock. Jarkevis Fields, who stated that he had quite a few family and friends in the house screaming go #1 and Go Wildcats, led the Wildcats with 11 tackles including 2 for loss. The playoff bound Wildcats will now await word on their next opponent. The FCS playoff field of 20 will be revealed Sunday afternoon at 1:30 p.m. on the ESPN family of networks.